A year or so ago I stumbled across an ebay auction for a homemade tool rack. The small setup was designed to hold a couple of tools like a shovel and axe as well as a fire extinguisher. I liked the idea and convenience and since the price was right I ordered one. It had a couple of universal mounting options and I found the one that best mounted to my rear rack. It has proved invaluable over the last year and has recieved many comments and compliments. Polaris Lock and Ride Install. D&G Enterprises Stock Photo. I looked up the same rack again a couple of months ago and found that the seller had created a new and improved version. I immediately got in touch with Dave at D&G Enterprises to see the new system. Dave is an experienced metal fabricator who came up with the rack idea to comply with his local riding requirements during fire season. Dave shipped out my new rack and when it arrived it was out with the old and in with the new. Universal fit usually means it kinda fits everything, but doesn’t fit anything well. D&G Enterprises has done a great job of overcoming this issue by providing several different mounting options. 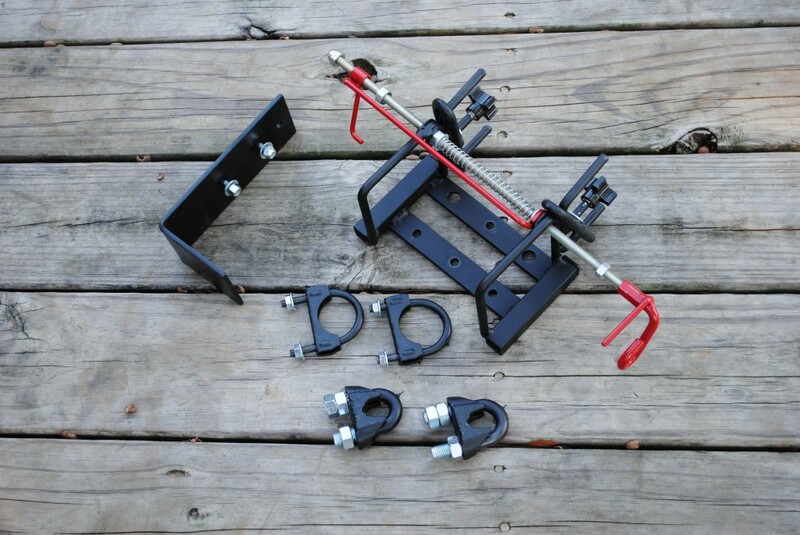 When you order one you can specify bar mounts for a 3/4 inch bar, a 1 1/2 inch bar or an L bracket. The 3/4 inch bar mount will fit most standard ATV racks. The 1 1/2 inch bar mount is a good fit on side by side roll cages. 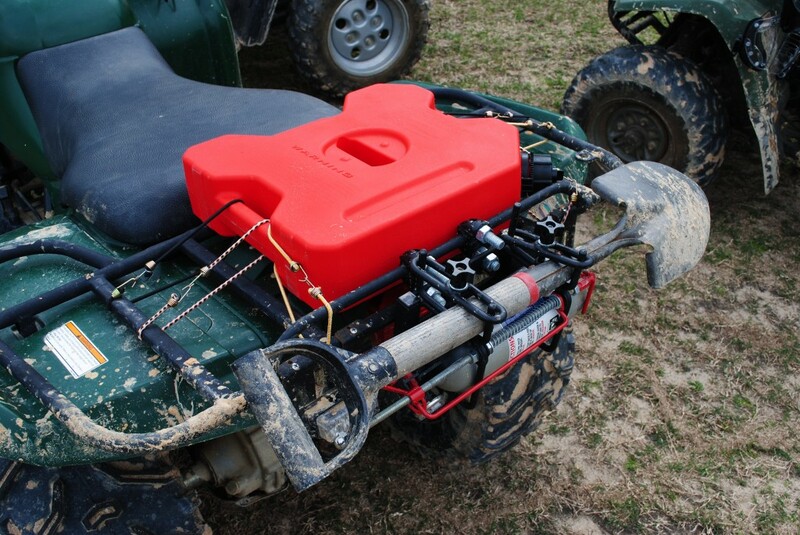 The L bracket works great for the Polaris Lock and Ride system. The unit could also be bolted directly to storage boxes or other scenarios as appropriate. The rack itself is welded steel. The rack and mounting hardware are laquer finished and the tool mounts are rubber coated. I have seen some rust spots in places where the laquer has been scratched, but that’s no different than the luggage racks and bumpers on most quads. A D&G Enterprises Tool Rack with all mounting options. You’ll need to pick the best one for you. 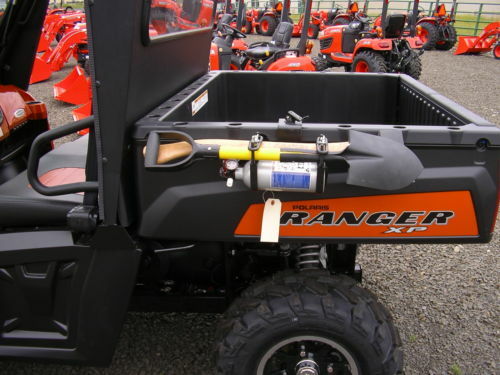 For tool mounting there is a designated spot to hold two tools horizontally. It’s perfect for a small shovel and axe. Other tools may make sense for your own adventures. The tools are held tightly in place by two plastic finger nuts. The fire extingusher is held into place by a spring-loaded bar. You simply compress the spring and turn it out of the way. The extinguisher slides right out of the bracket and is ready for use. It takes only a couple of seconds to remove the extingusher. This entry was posted in Accessory Review and tagged accessory, D&G Enterprises, rack, tool, utility by charlie. Bookmark the permalink.